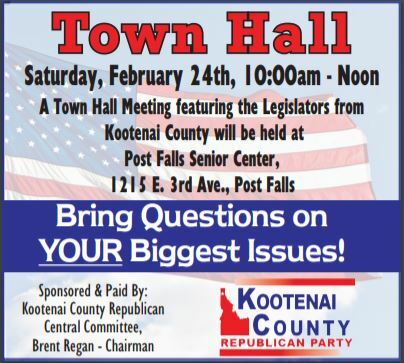 Calling all Kootenai County residents: The Kootenai County Republicans are hosting a town hall featuring state legislators from the county this Saturday, Feb. 24, 10 a.m. – Noon, at the Post Falls Senior Center, 1215 E. 3rd Ave. Legislators from the 2nd, 3rd and 4th Legislative Districts will be there to take your questions, hear your concerns and suggestions, and update you on all the latest from the legislative session. Everyone is welcome!